This is a great trip and a great trip report - one of the best ever from BBRSP and a wonderful advertisement for the state park. I collected my pack and scrambled up the big pouroff. This was probably the sketchiest move I made all week. I had my pack on my shoulders as I precariously tiptoed across the north side (left side in the photo). I knew it was a poor decision when loved ones started streaming through my mind halfway across. A better choice would have been to climb packless on the left and pull the pack up on the right. Yep. Those moments when you think, "My family will kill me if I die out here." After a long break I continued west. 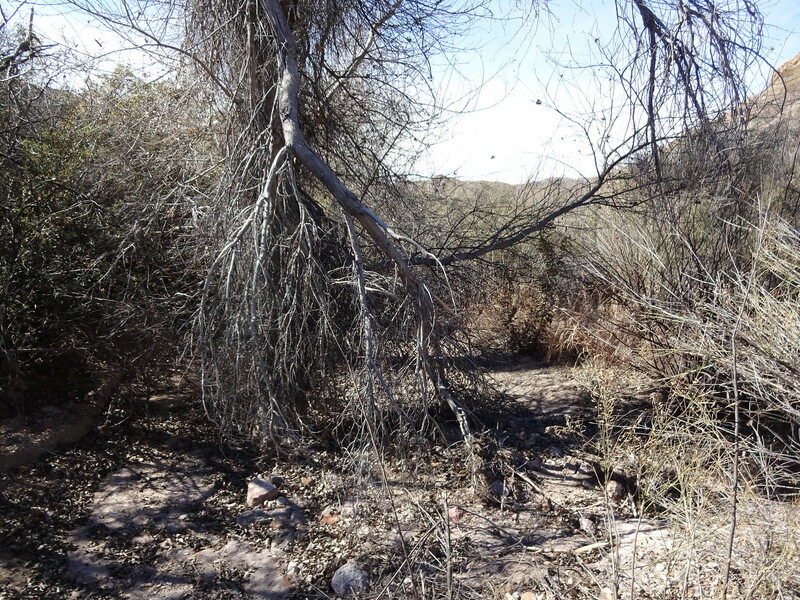 There is a confluence of several washes here but all you do is stick with the largest branch all the way to the road. Along this stretch, the park's map came in handy yet again in an odd way. 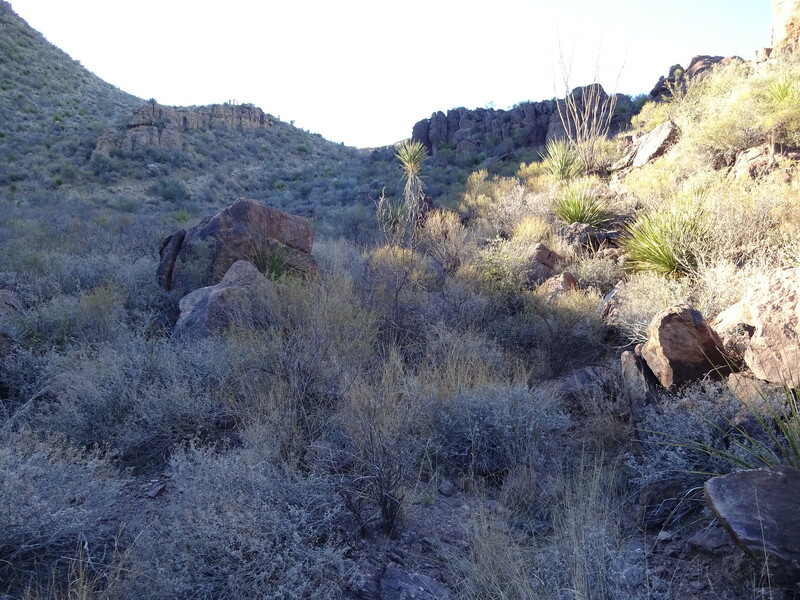 The terrain here is pretty featureless, and looking at my caltopo maps with 40' contour intervals, I couldn't really tell where I was. But looking at the park's map, with its 80' intervals, only the most prominent landmarks were shown, and it was obvious were I was. Sometimes less is more I guess. That's a good and fascinating point, DRS. BTW - I absolutely hate walking in deep, soft gravel. I feel your pain. Although I do not work in the field, my background is in geology. 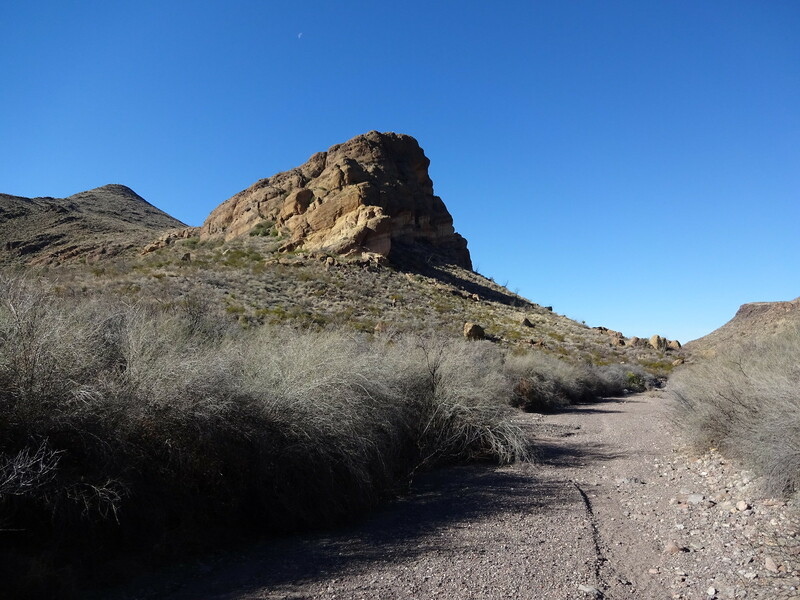 I would love to be able to hike through the Solitario, but I am not likely to ever be in a real position to do something like you have been showing us. So, I will live vicariously through your trip report. Thanks! Today would be my do-over day if those existed. 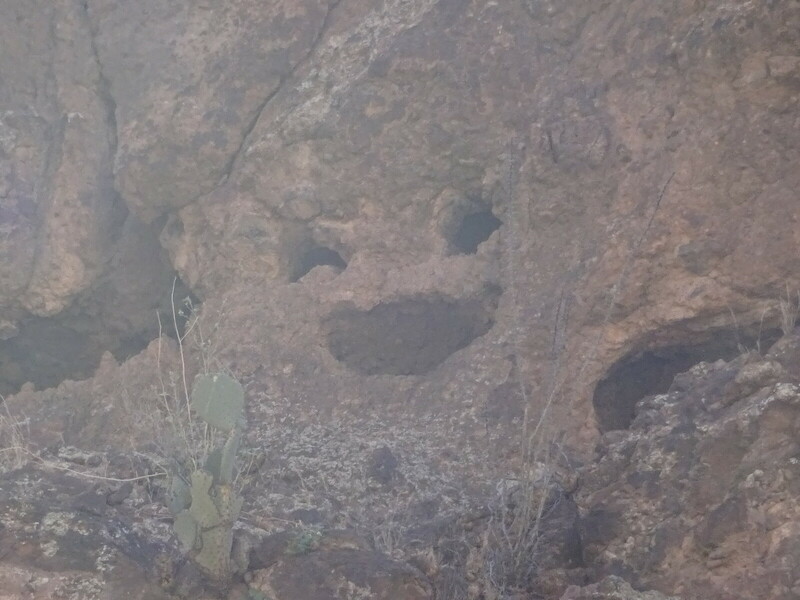 I continued down the wash I had been hiking yesterday evening. My original plan was to follow it all the way to Ranchieras Spring, where I would load up with two days worth of water. Thanks to the water report from the Outward Bound leader, I decided to instead head for Alamito Dam and add one liter, which would be enough to get me to Oso Spring. I soon came to a road and followed it north for about a mile, and then headed west across rolling hills with panoramic views. 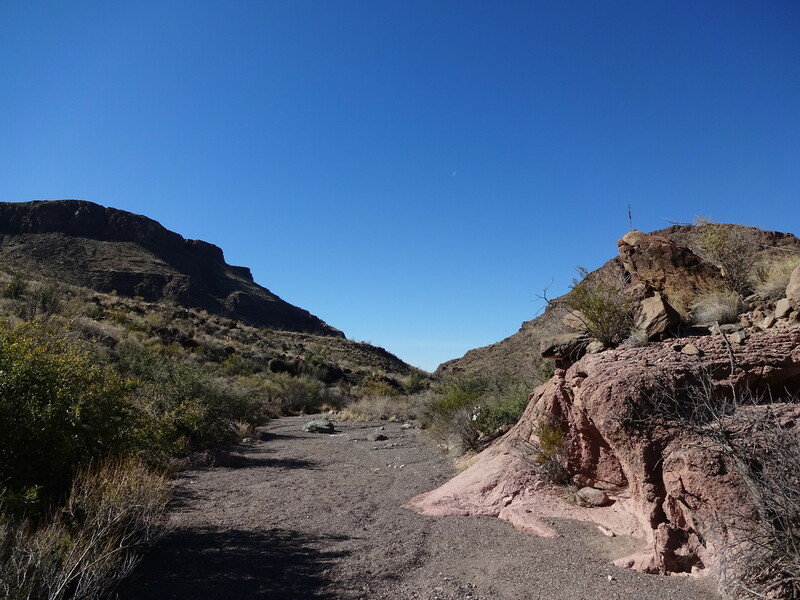 The approach from the east did not look easy, so I headed north to Guale Mesa Road and followed it back down to the campsite which had access to the Dam. There was a large green pool of water below the dam, where I slowly filtered a liter. The detour around the dam had cost me 30 minutes but it was still early in the day and I was not too worried. I then set out north across more rolling hills in the direction of Oso Mountain. You can see all the grasses, which were actually quite a nuisance on most of my cross-country routes this trip. You'd think the thorny/spiky plants would be the biggest bother, but these grasses are very hardy and they would stick into the mesh of my trail runners and poke my foot. The pain wasn't intense, but it was annoying enough I had to stop probably 10-20 times over the course of the trip just to pull grass out of my shoes. That said, the brambles were also pretty bad on the off trail segments. Early on, whenever my shirt snagged a thorn, I would stop and gently pull free of it before proceeding. But by day five, I had so many holes and loose threads in both my shirt and pants (including a two-inch gash over my left thigh) that they were no longer worth trying to save, and I knew I'd be chucking them after the trip. My skin was also somewhat numbed from all the gouging, and for the last part of my trip I just barreled through most vegetation that got in my way. That may not sound like fun, and it assuredly is not, but I consider it a small price to pay for being in this incredible desert. I found a nice line down into Oso Canyon. Heading west, the walking was pleasant for about a mile. 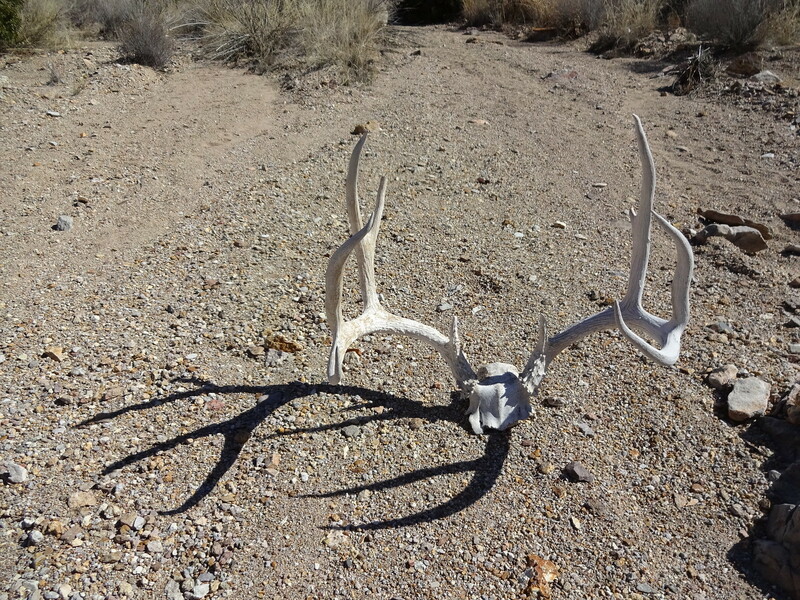 Along the way, I found this beauty right in the middle of the wash. It was so dense I didn't think I could plow through it even in mad bull mode. So I dropped my pack and spent 10 minutes scouting an alternate route up and over a little hill. But when I return to my pack, I noticed a tunnel through the trees on the lower left. So I followed this and donned my pack again after emerging. Continuing west, the little trees were still pretty thick but I was able to charge through as long as I had no regard for my clothing or skin. 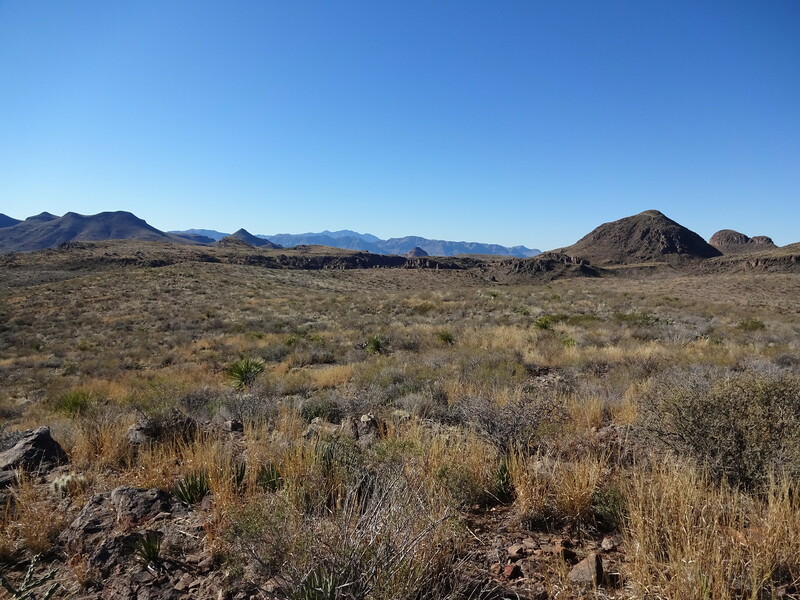 But that got old pretty quickly so I exited the wash to the north and began angling northwest over some more rolling hills to a more open wash that I had scouted via satellite, and which fed into Tapado Canyon. 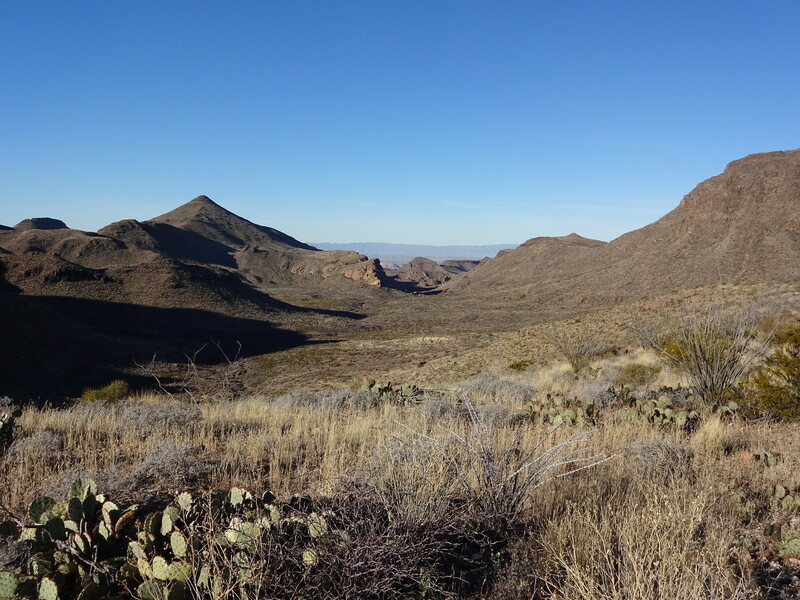 Shortly after leaving Oso Canyon this was the view west in the direction of Oso Spring. I continued northwest and was most of the way to the big open wash I planned on dropping into when I decided it would be good to get my bearings. I looked down to my right cargo pocket where I keep my maps and … my bundle of caltopo maps was gone. Did I mention what a good idea it was to have brought along the park's map? Thankfully that was still in my pocket. And I kid you not that earlier in the day I had said to myself, "you know, Shorty, you really should tuck those maps away, they might snag on something." It was about a half mile back to Oso Canyon where I was pretty sure I had lost the maps in the big thicket of trees. My guilt kicked in, so I decided I would go retrieve the maps, and I began working my way back to the creek. As I did so, my mind was definitely not right. I was not only feeling really dumb, but also worried about being able to make my targeted campsite at Nopalera with this additional delay. And when you're distracted and agitated like that, you're all the more likely to make another mistake. Sure enough, about 5 min. from the creek, I barreled straight into a cactus with my right shin. I looked down at my leg which was searing with pain, and saw 50 needles sticking out of my pants leg. I gently pulled the pants away from my leg and up, with most of the needles staying embedded in my skin. Thank goodness I kept my tweezers in my shirt pocket. I stood there stooped over pulling out needles for the next 10 min. At that point I knew it was time to return to my pack before I made a more serious mistake. Once back to my pack, it was only another 5 min. 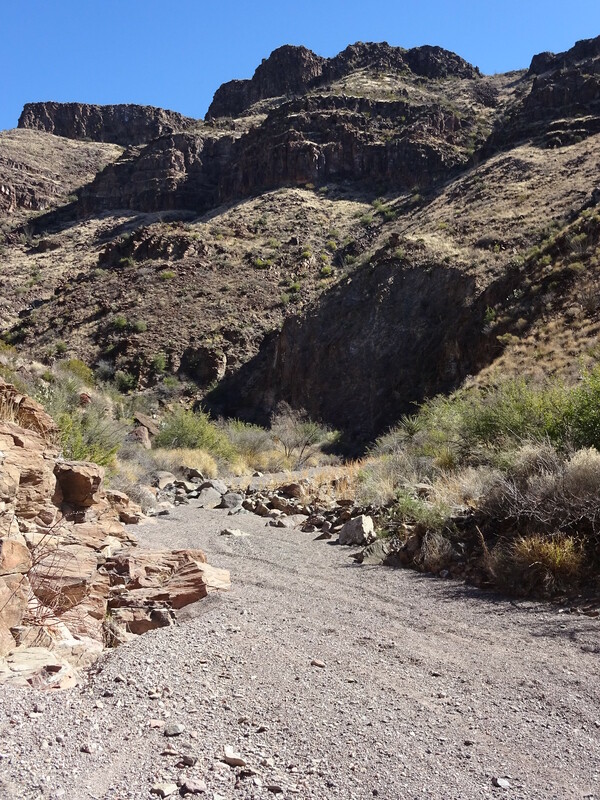 before I was in a big wash which I followed downhill to Tapado Canyon. 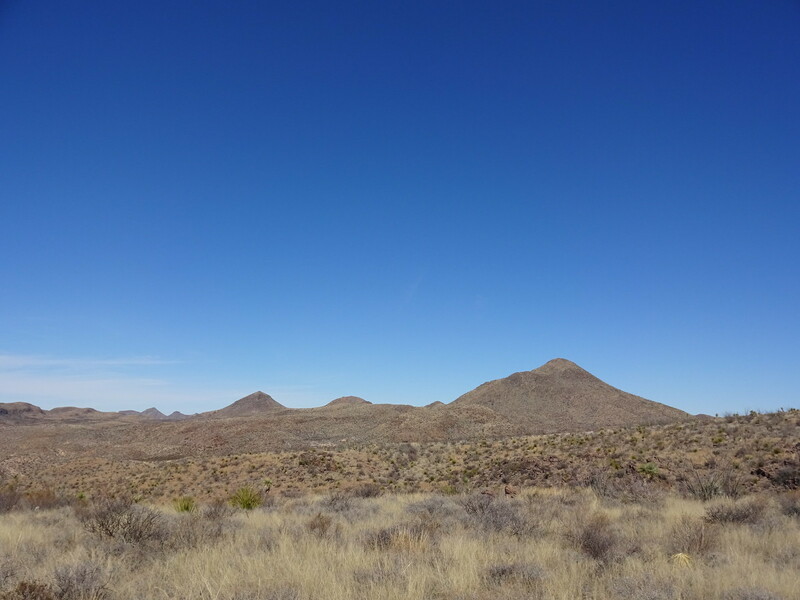 Once in Tapado, which is very impressive, my mood improved as I thought my last cross-country route might be over. 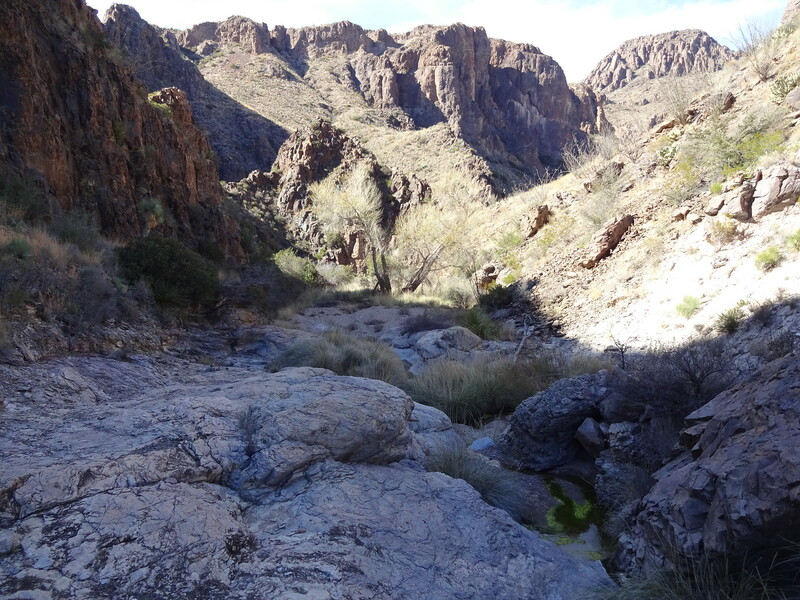 I headed down canyon between massive vertical walls where Oso Canyon meets Tapado, where there was a strong, clear flow. I spent 40 minutes filtering four liters, and also took a little time to explore up Oso Canyon. 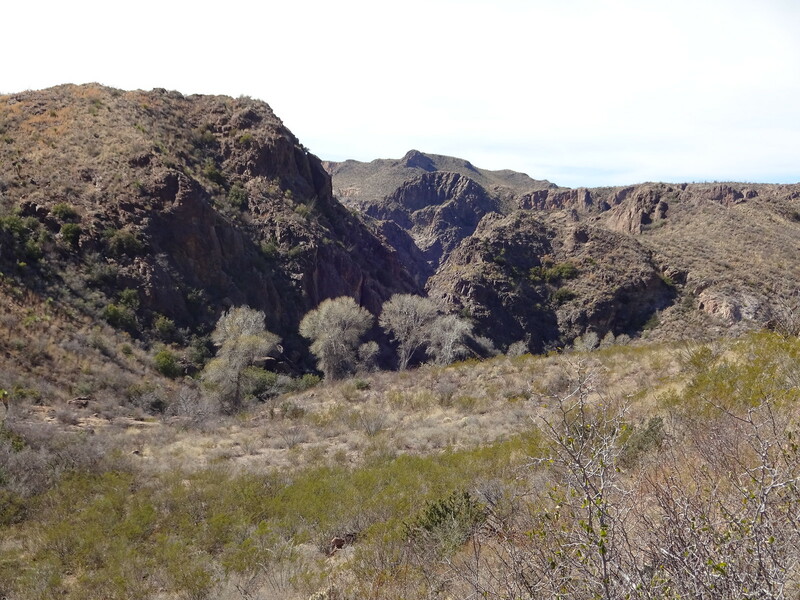 Here's the view from the spring, at least where it is marked on the map, looking back toward Tapado Canyon. 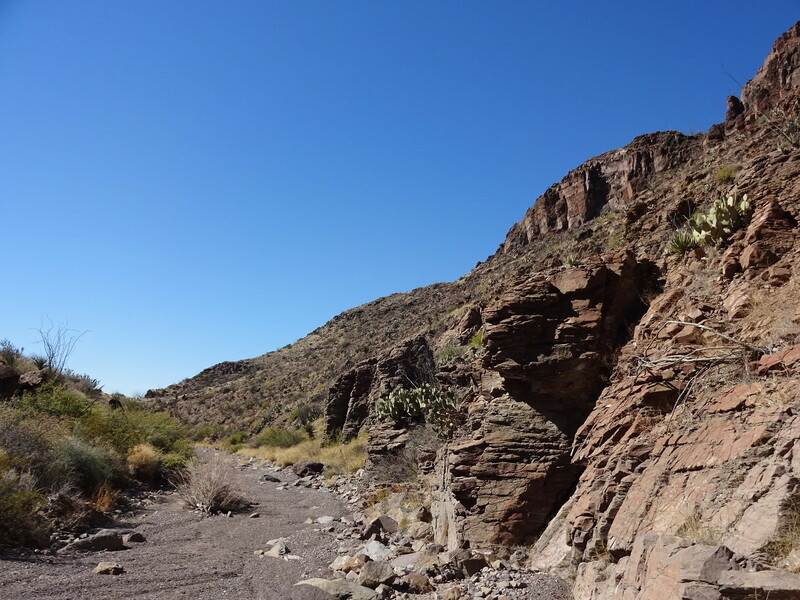 Finally around 4 PM I loaded up and headed back up Tapado Canyon, which I intended to follow all the way to its headwaters near the Nopalera trailhead. After just a couple of turns I came to what I thought was just a very large side canyon, and said to myself "huh, that's a large side canyon." 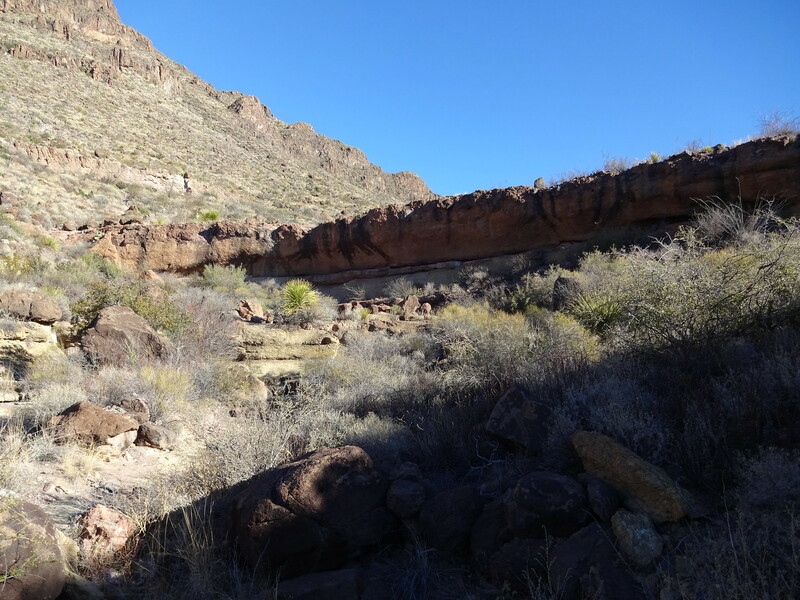 I don't know why I didn't pull out my one remaining map, because it certainly would've told me that that side canyon was in fact Tapado Canyon. 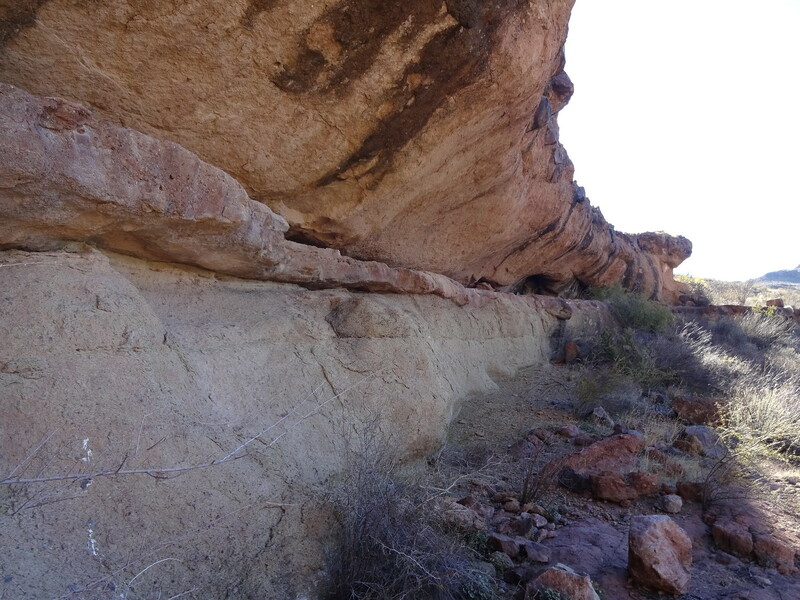 But the other branch was clearer and actually had some footprints, so I just assumed it was the main canyon. In retrospect, I was mentally fatigued and just not thinking clearly. One of the perills of hiking solo. 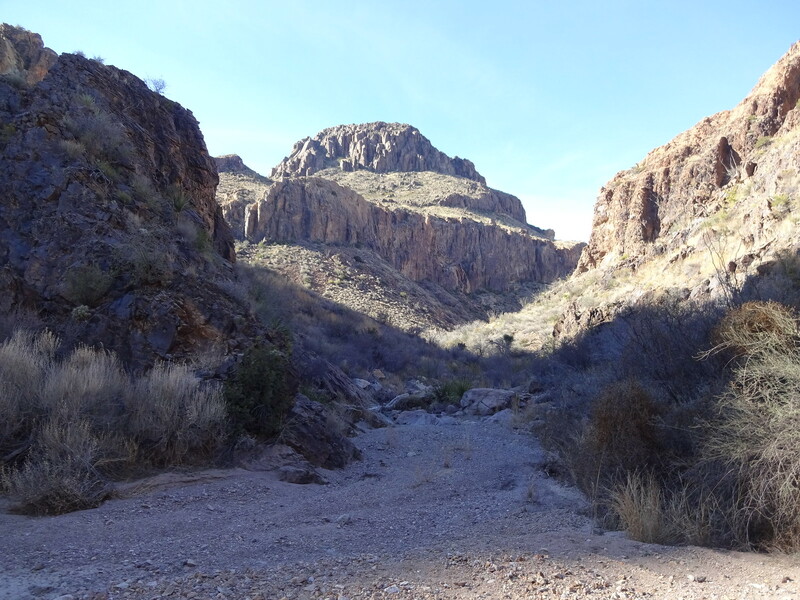 So I continued north up some other canyon, and went another mile before I decided I was definitely not in Tapado Canyon. I climbed up a hill to the west and looked around, but the features were a bit too indistinct to know for certain where I was. And that's where the park's map saved me one last time. 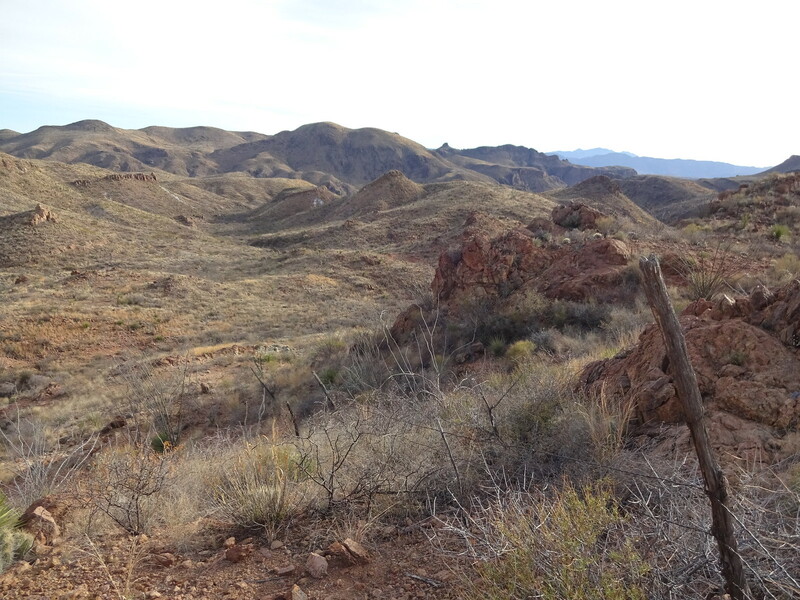 I mentioned earlier it shows all of the old ranching fences, and sure enough, there was a fence in plain view. 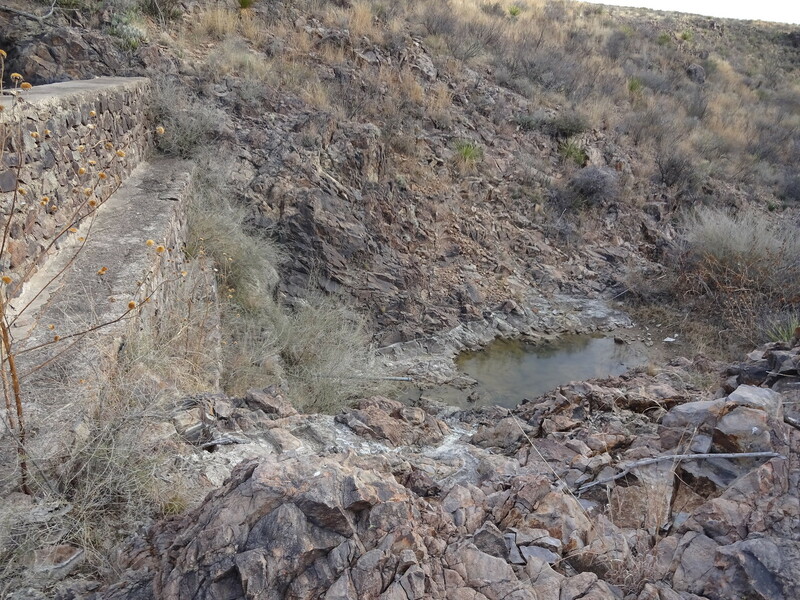 Not only that, but the fence ran directly to the Fowlkes Stone Dam in upper Tapado Canyon. Here's looking back south on the fence and the area where I realized I was off course. So I humped it over a couple more hills and eventually made my way to the Fowlkes Stone Dam which had a lot of water at its base. At last, I thought, my navigational troubles were over. 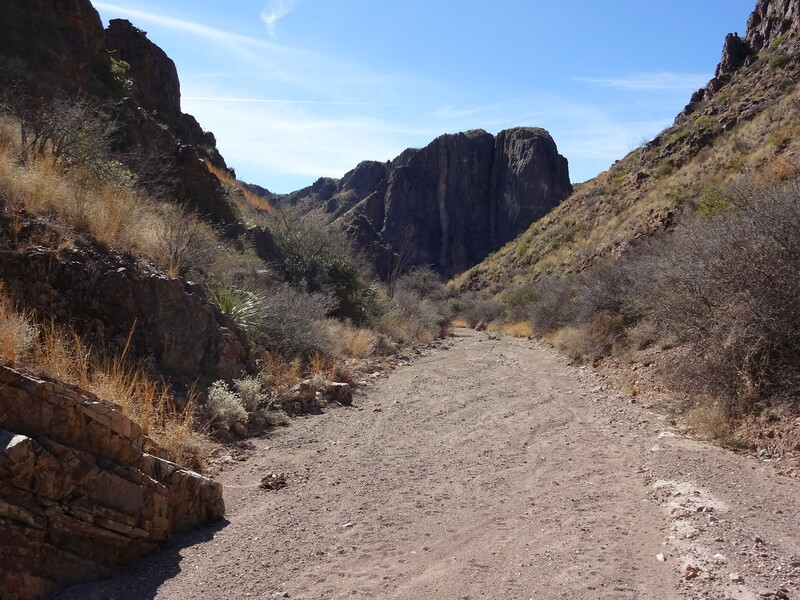 I would just continue up this wash and it would take me to the Nopalera traihead and I'd be home free. And of course there was a huge pouroff that it took me 15 minutes to work around. Long story short, after shedding a little more blood and skin, I finally made it to Las Burras Road. 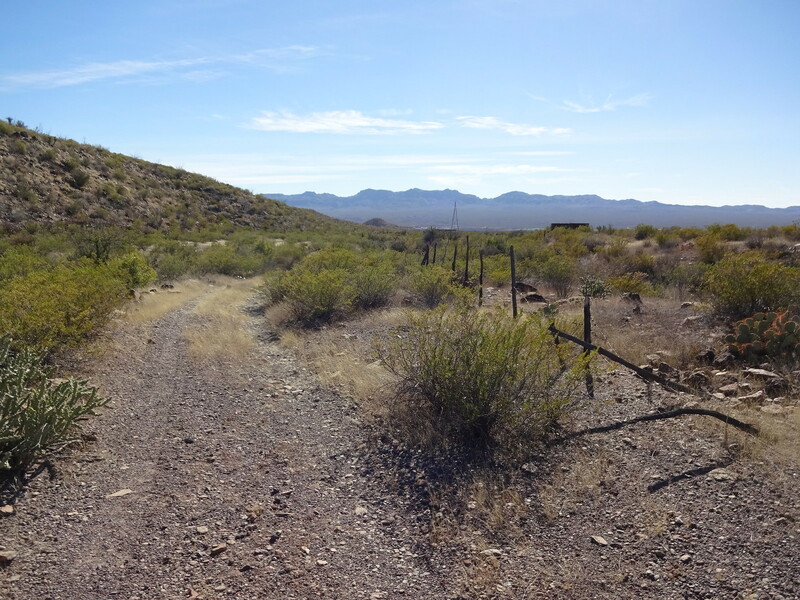 For once I was happy to be walking on a road, and followed it north a short ways to the Nopalera trailhead. 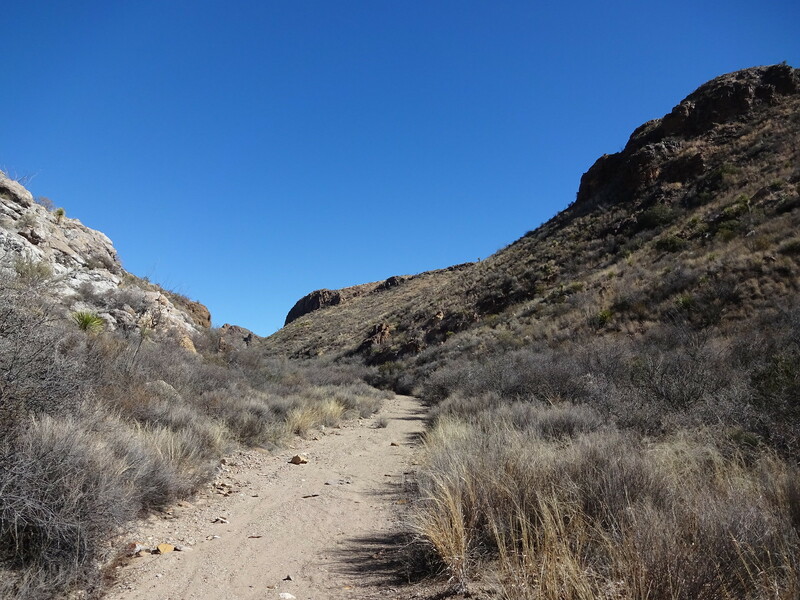 The Nopalera trail is another old ranching road that goes past an old house and down into Auras Canyon. Unfortunately it's much more overgrown than the old road I walked on in the Solitario. 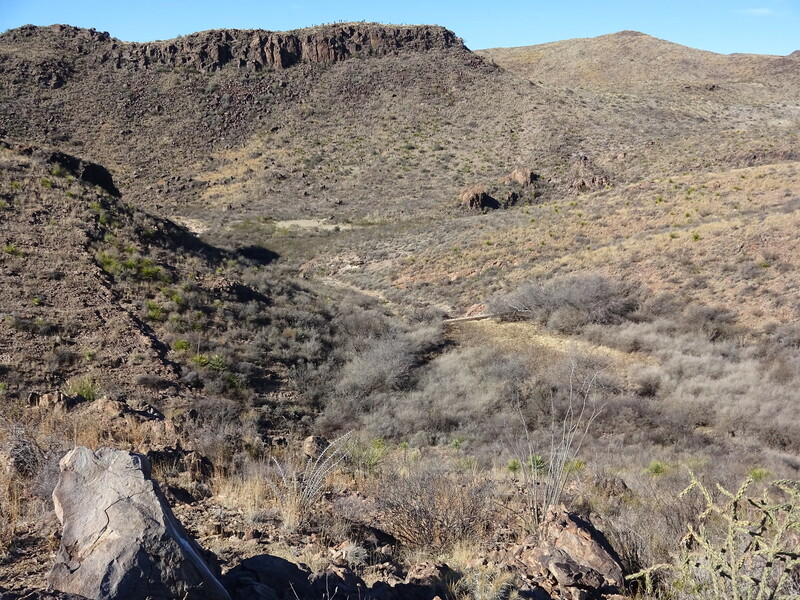 I lost it a few times but eventually found my way to the Nopalera ruins where the land was flat and ideal for camping. Somehow I had made it far enough to finish out my trip as planned. In the twilight a squadron of javelinas emerged and began making their rounds. The first one to get close to me was a juvenile who, when he saw me, turned and bounded away squealing the whole way. The bigger ones were less concerned. One got within about ten feet, took a look at me, and casually went on with its business. By the time I slipped into my bag they had moved on. 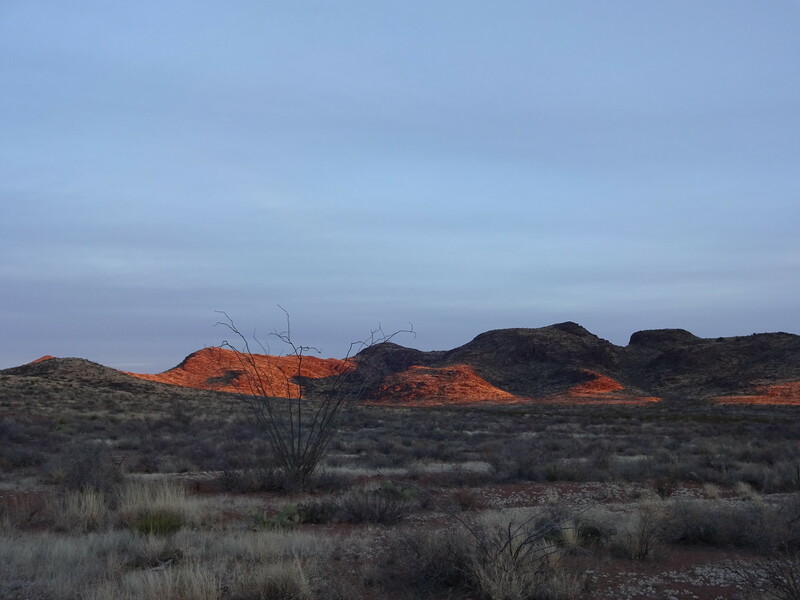 One downside of this campsite was that I observed light pollution for the first time ever in Big Bend, coming from the direction of Presidio. Despite two egregious mistakes today, I was never too worried. 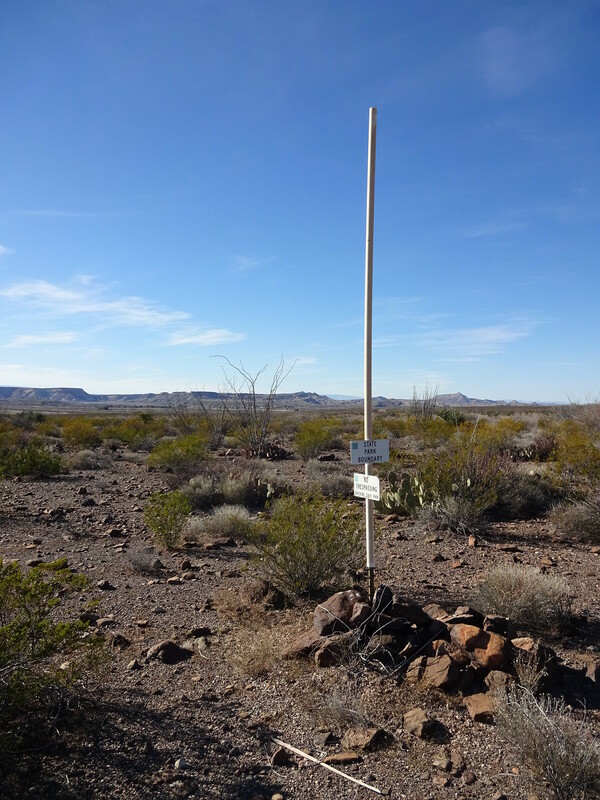 Had I not had a backup map, I could have still found my way to Tapado Canyon and hiked down to FM 170, using my InReach to update my friend on pickup location. 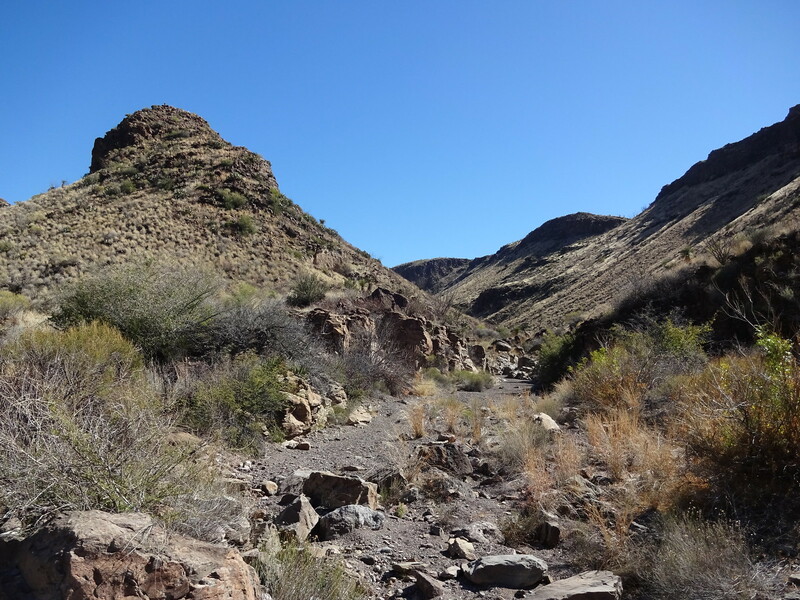 Had I not been able to rejoin upper Tapado Canyon, similar story, I would have just headed back downhill and hiked out Tapado the next day. God bless you, Shorty....we've all been there. Sometimes the Oso Canyons of our lives are just....a bear....and there's no way around it. I still think you made it through with flair and gr.....it. As a fellow solo hiker, I empathize and sympathize with all the challenges and blunders of your trip. They're not uncommon. But, in the end, you made an uncommon success of them. And you fully explored and fully experienced terrain that few us have ever seen, or ever will see. Well done! Well played! There are just days like that and that map loss could have been real disaster but your backup was gold. Tapado looks way interesting. Really good trip report. Thanks for taking the time. You gave us all some really good detail for future use. The going was slow, but at least the views were good. To anyone thinking about hiking this in the future, a GPS would not be a bad idea because you can make out most of the road from satellite and could set waypoints. But still expect to do battle with the plant life. I lost the road on its final drop down into Auras Creek, but that worked out all right because I came upon a pouroff like I'd never seen before. There was water up above the pouroff, so I added a liter to my collection. I had been cutting it close on water because filtering was such a chore, and had only budgeted three liters for today. It turned out that that's all I needed, but it was nice to have the insurance. Once in Auras Creek, I was finally home free. No more route finding, just follow the gravel. I think I will slot Auras Canyon in at the number two highlight of the week. It wasn't quite as colorful as Arroyo Mexicano, but it more than made up for that in its length. 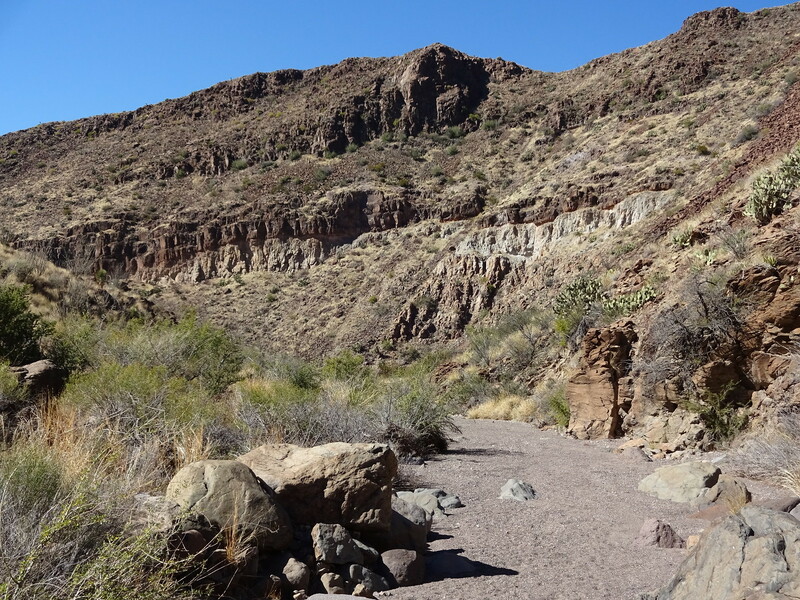 6+ miles of high canyon walls, gentle twists and turns, massive talus fields on the slopes, and the feeling that not too many people had ever walked this way. 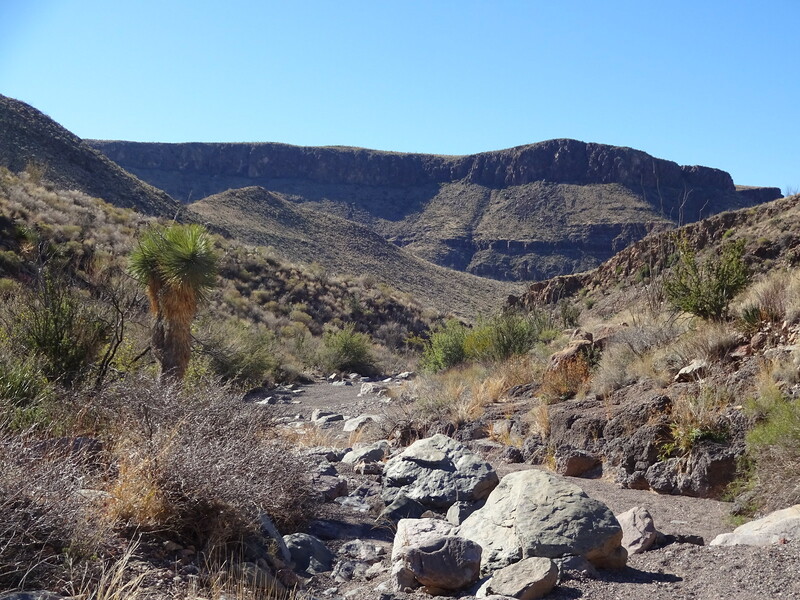 When I finally emerged from the canyon, I jogged over to an old road that ran past some ruins. 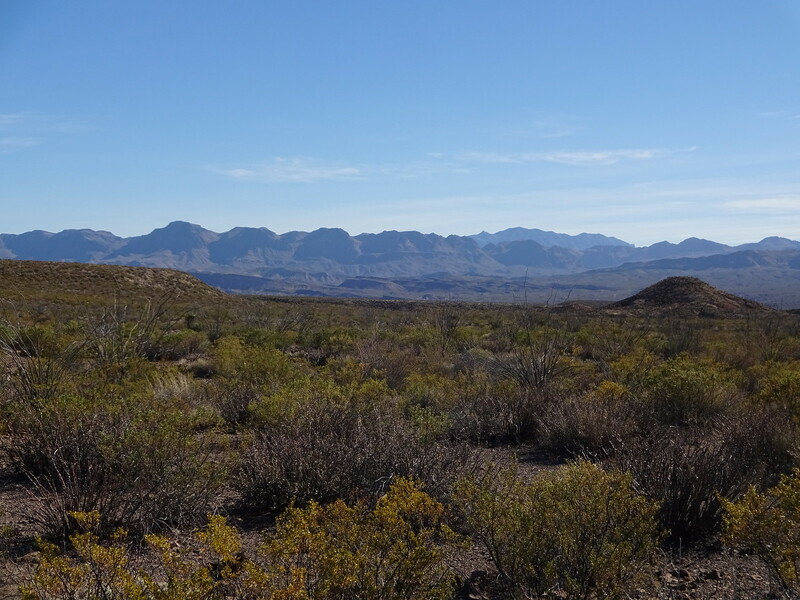 There were expansive views of the mountains south of the border. The park boundary is clearly marked by these occasional poles. The road does cut across private property for the last mile, but if one were to follow it all the way to FM 170 (hypothetically speaking, of course), one would not feel too guilty -- there's no buildings in sight until you get all the way to the pavement. I had texted my friend earlier in the day to rearrange my pickup for 4:30. I walked out precisely at 4:30 and he rolled up 5 minutes later. Later that evening I was taking a shower and as I was soaping up my legs, I felt something -- an inch long needle buried halfway in my shin. I laughed and wondered how long that had been there. Afterwards, I chucked my hiking shirt and pants and we headed off to dinner at the Starlight. Great report DRS and thanks for taking the time to document the trip. If this keeps up I will have to start a BBRSP backpacking trip reports page. Your knees must be feeling better too! state park shine. Thanks for taking us there. I really, really enjoyed it. I hope you had as good or better time doing it as I did reading about it. 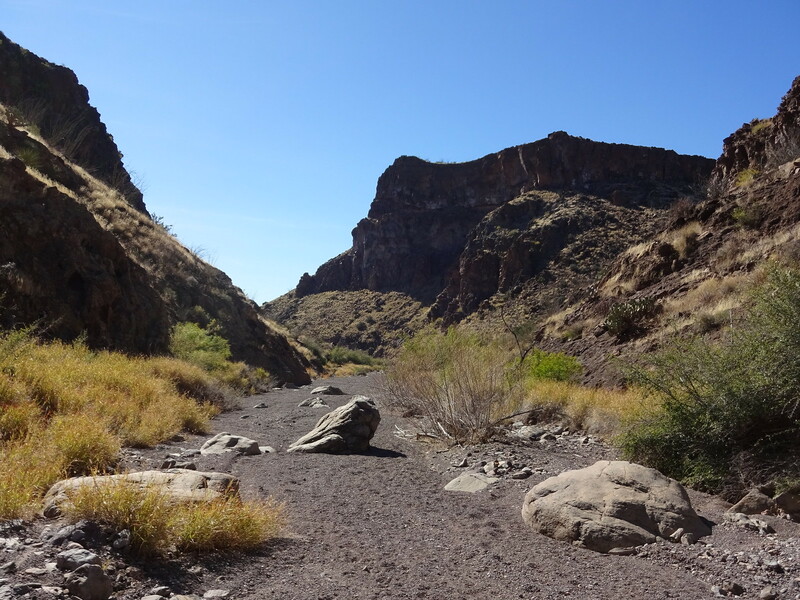 Like Mule Ears, I thought a lot about your knees while reading each daily chapter, and was impressed with the prodigious amount of off-trail scrambling you did. You are one tough backpacker. I haven’t been to BBRSP in almost twenty years, and the trips I did take weren’t as ambitious as yours. This report really makes me want to go back again soon. Definitely. 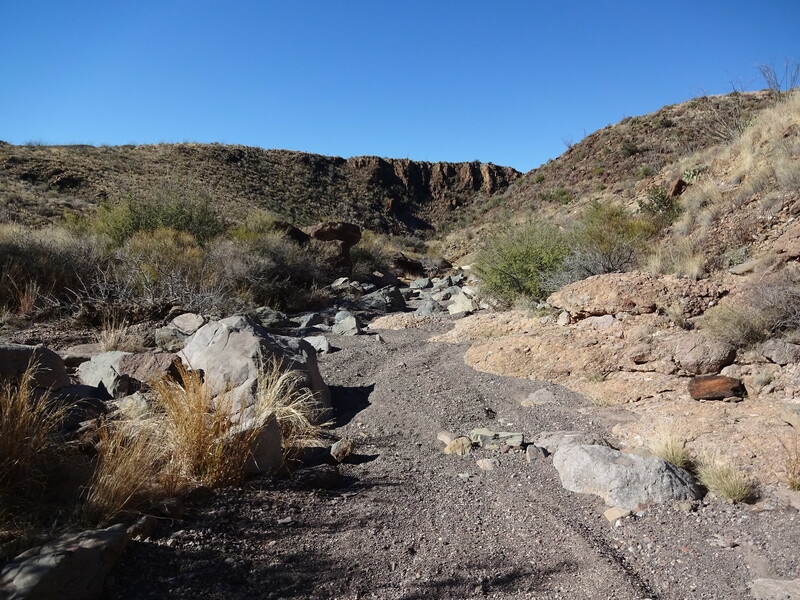 This is my 3rd trip since last winter's Slickrock/Tornillo trip, and I've been pushing it a little harder each time. The Cho-Pats are simply amazing. Thanks man. As you guys know, trip reports are partly for the author, as a sort of scrapbook and as a way to reflect on what the hell I was thinking on Day 5 (and hopefully learn from it), but also to inspire or aid in future trips by others. But that also comes back to the author in a way: if I get you to take a trip to BBRSP and write a report, I get to revisit the park through you. 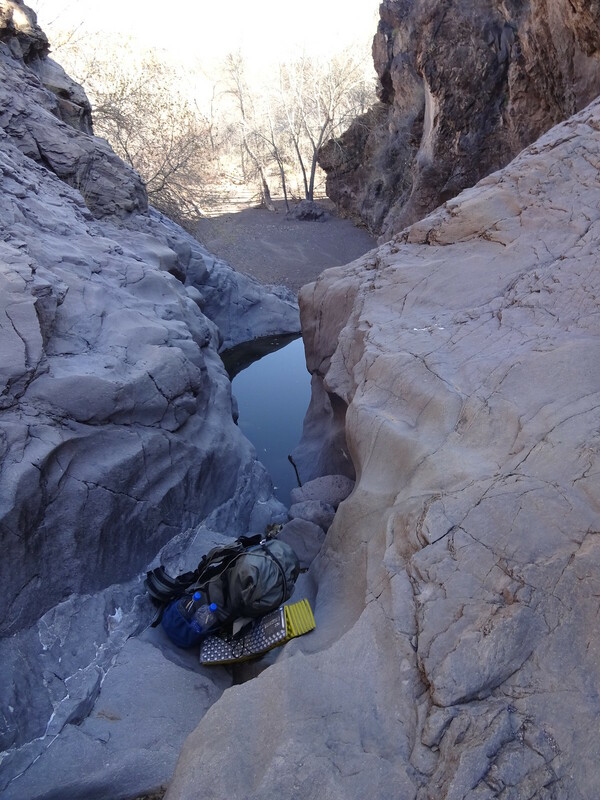 Hopefully this report will inspire a few more backpackers to try the state park, and we can gradually start to build up a knowledge base of water sources and routes like we have for the national park. Just one little comment on gear. 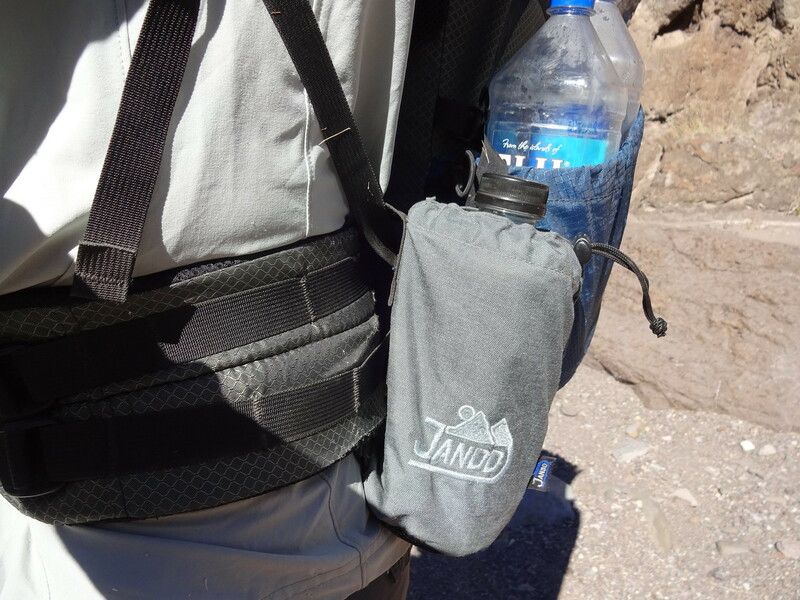 This is now the second trip (after my Canyonlands trip) where I have used the Jandd Mountaineering hipbelt water bottle holder. Photo taken on day 6 so it will definitely hold up to abuse. I was carrying a 15 degree bag which took up about half my pack, so I needed to carry all my water outside my pack. The hipbelt bottle holders, combined with two 1.5 L bottles in each side pocket, gave me a carry capacity of 8 L. Plus the holders transfer the weight directly to your hips so it saves your back, and they loop through the shoulder straps so they don't slide off when you doff your pack. to see if you were still using the same pack as last year (I assumed you were) and noticed a water bottle holder on your hipbelt. It reminded me of the old Outdoor Research bottle holders I used to use and I meant to ask you about it but never got around to it. The problem with old OR holders (of which I still have a few) is that their attachment method (one velcro strip) didn't hold the bottle sufficiently close to the pack. The cantilevering was brutal. If you happen to run across any photos on BBC of my kids or my wife backpacking with me, you'll probably still see them being sadomasochistically employed on their packs. I'm glad to hear that the Jandd version works so well. I may have to take a look at those for myself and my family. That's a thing? I've been to the interior of the park all of one time but it didn't take me long to figure that out.